As a follow-up to my last post about Queen Anne’s Revenge, here is the man himself—the terrible Edward ‘Blackbeard’ Teach. I show him in close-up so you can see the slow-match fuses he used to weave into his whiskers and set alight before attacking a ship. You can find him in P is for Pirate, now available in bookstores—or drop me a line in the comments for an autographed copy. Pirate captains were elected by their crews and could be voted out. To keep his crew in line, Blackbeard constantly showed himself to be more fierce, more outrageous than anyone else on board. Seated with his rogues during dinner, Blackbeard fired a pistol underneath the table and wounded one of the crew, just to remind them who he was. Queen Anne’s Revenge, that is. Queen Anne’s Revenge is the name of Blackbeard Teach’s flagship—though I have to admit I don’t know why he chose that name. Queen Anne ruled Great Britain & Ireland while Blackbeard was alive, so maybe he considered himself to be a privateer on behalf of the Crown? Was he not happy with the War of the Spanish Succession? I’d like it if, in the comments, someone could offer a better reason behind Teach’s name for his ship. Writers Alexander Pope, Jonathan Swift & pirate aficionado Daniel Defoe flourished under Queen Anne, so maybe her reign really was culture’s balmiest day—but why did she need to be avenged? Anyway, he only captained Queen Anne’s Revenge for 3 years before she sunk off North Carolina. And so I had the wonderful opportunity to paint a sunken pirate ship for Eve Bunting’s new book, P is for Pirate. It was also a chance to pay tribute to fantastic illustrator Lloyd K. Townsend. When I say ‘pay tribute to’, of course I mean ‘steal shamelessly from’. I’ve admired Townsend since I was a wee lad, seeing his paintings in National Geographic. One in particular, from 1979, shows the sunken Spanish treasure ship Tolosa. This was my—cough—inspiration for R is for Revenge. Hey, at least I turned the ship around to face the other way! Here is your Monday dose of P is for Pirate—available in bookstores everywhere by Eve Bunting from Sleeping Bear Press. The Articles were the pirates’ ethical guidelines which set out rules for behavior & working conditions aboard ship. New crew members signed them before becoming part of the ship’s company. Did you know that the pirate captain was elected—and could be voted out if he didn’t meet the crew’s expectations? 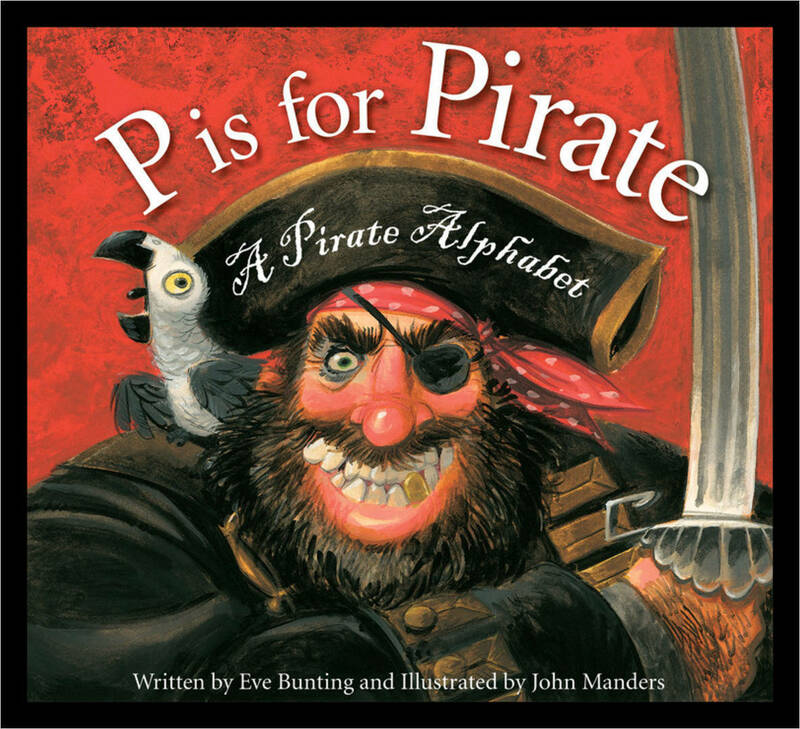 P is for Pirate is here! As long-time readers know, the subject of pirates is a favorite of mine. You can imagine how happy I was when Sleeping Bear Press asked me to illustrate Eve Bunting’s latest, P is for Pirate. Here’s how the jacket art came together. Some rough sketches, a tight sketch based on the approved rough, the painting in progress. I lost something in the tight sketch—the pirate doesn’t have the same aggressiveness & oomph—so I went back to the rough sketch to paint from. That’s my dear old African Grey, Sherman, sitting on his shoulder. How I miss him! I like this low-key palette, mostly blacks, greys and red. The talented Felicia Macheske was my art director on this project. I will show more images throughout the month. I’m using a palette knife to scrape red paint over the black background.